Jake Shimabukuro, famous ukulele musician, spent time at Bolsa Grande High School last week to share his talents with students with special needs. Shimabukuro, who is internationally famous for his musical ukulele talent and currently tours to sold out concert arenas throughout the country, created a foundation in 2015 that gives back to the community. Shimabukuro’s goal is to bring music to students, and make the dream of expanding music programs throughout public education a reality. 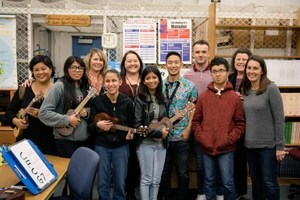 Jake Shimabukuro, famous ukulele musician, spent time at Bolsa Grande High School last week to share his talents with students with special needs. 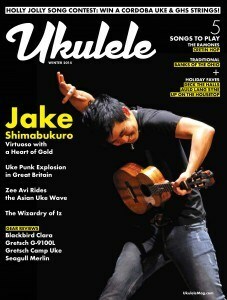 Shimabukuro, who is internationally renowned for his musical ukulele talent and currently tours to sold out concert arenas throughout the country, created a foundation in 2015 that gives back to the community. Shimabukuro’s goal is to bring music to students and make the dream of expanding music programs throughout public education a reality.